Prayer, scripture and a sermon from one of the pastors are always included in our traditional worship services. Music is also an important element of worship. Hymns are sung both from the United Methodist Hymnal and the Faith We Sing book. 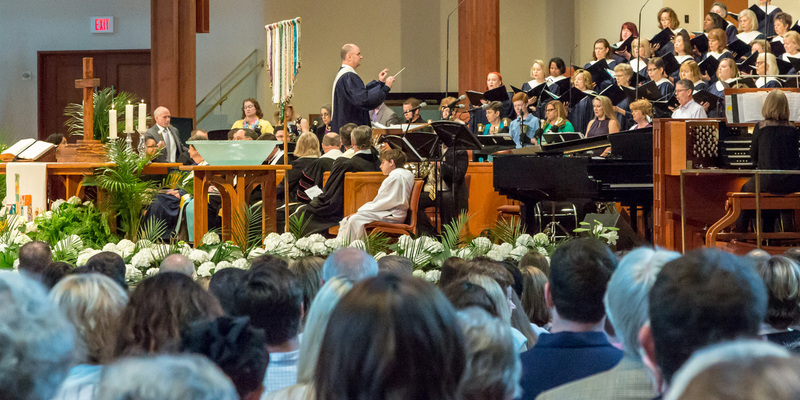 A wide variety of music is a part of worship services throughout the year. Adaptations of hymns, gospel, classical, and contemporary Christian music will be heard in our traditional services. Orchestra, drums, brass, piano or organ may be a part of the musical presentation on any given Sunday. Communion is served on the first Sunday of each month, except December when it is served at Christmas Eve services. The United Methodist communion table is open to all who seek a relationship with Jesus Christ regardless of age or church membership. Media screens are used to display worship music, scripture, and information. CHILDREN are always welcome in worship. Children's Time is a part of each service. The Director of Children's Ministry invites children to join her down front for a brief message. To keep little ones occupied during the rest of the service, activity bags are available at the entrances to the sanctuary. Alternatively, nursery care for children up to two years old is available during all worship hours. Children's Sunday school classes are also held for various ages at the same time as worship services. WHEELCHAIRS are accommodated beside the narrower front row pews.